RHH Buyer Specialist is Rookie of the Year! 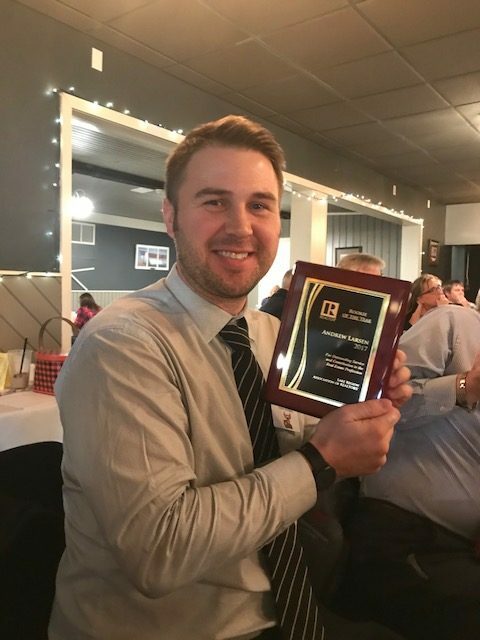 Andy Larsen was announced the 2017 “Rookie of the Year” for outstanding service and contribution to the real estate profession at the Lake Region Association of Realtors! We are so proud of you Andy and thankful to get to work with you each day!! As a Buyer Specialist on our Ryan Hanson Homes- Keller Williams Realty Professionals team, Andy’s focus is on buyers where his patient and attentive nature is truly an asset as he guides them through the sometimes overwhelming real estate buying process. His calm demeanor, integrity and professionalism immediately puts both buyers and Realtors at ease paving the way for mutually beneficial relationships and win-win negotiations. In his first year of real estate, Andy closed 54 sides with $8,413,750 in volume and he is showing a propensity for growth as he has closed 61 sides already this year (as of 12/18/17) with $9,247,770 in volume and another 4 slated to close by year-end. As a real estate rookie Andy is on the right trajectory for growth and success, and we are excited to see him shatter his goals in 2018 all while working in the best interest of his clients, this community and our profession.